A strategic game of solar destruction and salvation. 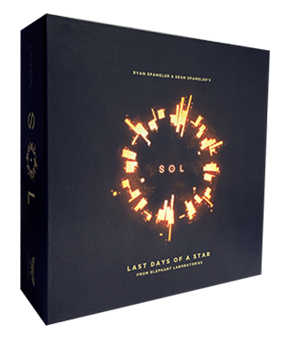 I had the pleasure of working with Ryan and Sean Spangler to create a rules summary for their fascinating game Sol: Last Days of a Star, a summary they printed and put in the box. New Kickstarter authors occasionally reach out to me, but I could see there was something special about this one. That the game is a labour of love is obvious in the care that’s been taken with the entire production, and the quality of the final game. And it is a good game too, quite different to everything out there. The theme is like something out of a progressive rock song by Yes, and the stylish minimalism of the design is very refreshing in a market crowded with dungeoncrawlers and zombie miniatures. Of course, a few things were changed after I’d finished the summary, and now I’ve played and enjoyed the game I’ve also seen a bit of room for improvement; so this is my latest version, slightly updated from the one you’ll find in the box. I love the aesthetics, art and idea of this game. For some reason it reminds me of Qyshinsu, although I realize the game play is completely different. Do you have any thought on how this plays solo, Peter? Yes, it does have a slightly abstract, almost modern art feel. I’ve never played it solo Tom – with the EOG, I never have any time for solo gaming! 🙂 Try it out and let me know what you think.